Regrettably our application for the final 9 exceptionally large self build plots was refused by Copeland planning panel on 21 November 2018. We considered these final plots to be a natural completion of this parcel of land. However; Cleator Moor town council & St Mary’s catholic church objected, a representative from both voiced the concerns of their respective communities. Additionally, 20 residents of a local care home each decided to sign a copy of a common letter and object. We are disappointed that the planning panel did not take the opportunity of walking onto the ground of these large plots, they would have been more able to appreciate how the low lying ground and existing hedge lines shelter the views from and into the site. Our landscape architect had provided to Copeland planning department an extensive additional landscape scheme which additionally sheltered the site, we are uncertain if this information was made available to the panel. We are considering going to the Planning Inspectorate requesting their decision on the application. Copeland planning panel councillors carried out a site visit for the final 9 self build plots at Far Meadow being the most northerly part of our self build development at Flosh Meadows on the afternoon of Monday 22 October 2018. We had earlier that day set out wooden posts with bunting to assist the councillors in fully identifying Far Meadow. When standing in the site itself it can readily be seen how the natural hedges and low lying flood free ground assist in making this a considerably secluded site. The gaps in the hedges will be infilled as shown on our plan below to provide even more substantial seclusion and we are pleased to exceed the 300m gap that Copeland say should be between our site and the bottom of Cleator Moor. Indeed a substantial part of the gap consists of old mine workings with made up ground being an ideal habitat for flora and fauna. The small number of planning panel councillors with two planning officers were accompanied by two observers being a Cleator Moor South ward councillor who had some input to the planning officers but certainly not as much as the town clerk; the sole Cleator Moor town councillor who is also a planning panel member spoke the most. It would be interesting to know what the ward councillor and town clerk said especially as the town council are objectors, however we will never know unless all are formally questioned for any reason. We are hopeful that our application for these final 9 self build plots will be decided by Copeland planning panel in late November 2018. Working closely with our landscape architect we have shown in our planning application only nine large plots identified by letters A-I at the north of our land and designed the site with circular exercise walking routes connecting different parts of the site to support community integration while providing wildlife corridors to help the biodiversity needs. This final full site design with the only possible change of reducing the number of plots, shows prospective purchasers how the site will grow into a well integrated attractive housing community offering no unknown future layout problems. The plots have a variety sizes and will be released in a controlled staged procedure. As a result of an increased number of local families requesting to purchase a plot and build their family home at Flosh Meadows we are submitting a new application for 19 Self Build Plots. 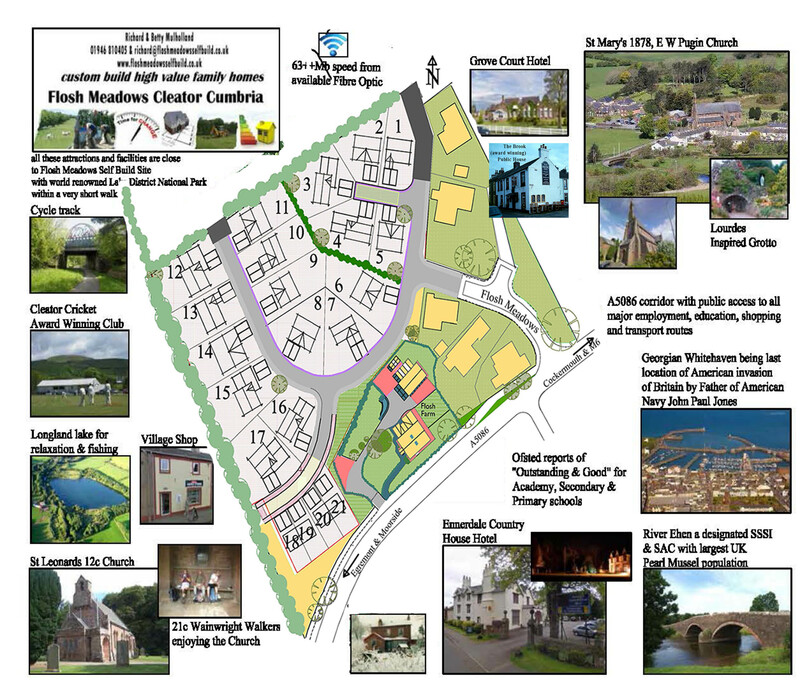 We have as always informed our neighbours, St Mary’s church, Cleator Moor Town Council & Cleator Moor Chamber of Trade of the plans. The proposed new homes will be 97m and more away from St Mary’s Grotto as seen on the plan below. This is considerably further than the 1980s/1990s existing houses including the busy hotel and car park; we are hopeful that St Mary’s church and community can support our hopeful self build families. We continue to receive requests for self build plots at Flosh Meadows, especially from local families. The application land is substantially hidden from view from Jacktrees Rd and St Mary’s Grotto due to the site lower ground levels and existing substantial & improved hedges. Additional land has been granted for our self build plots at Flosh Meadows which is just over 1 mile (2 km) to the Lake District National Park World Heritage site. We had a long detailed meeting with St Mary’s Parish Priest and a Pastoral Council member to explain & discuss our planning application before it was considered by Copeland planning panel. We hand delivered our planning details to all properties & businesses close to the site and told them we would be happy to answer any questions. 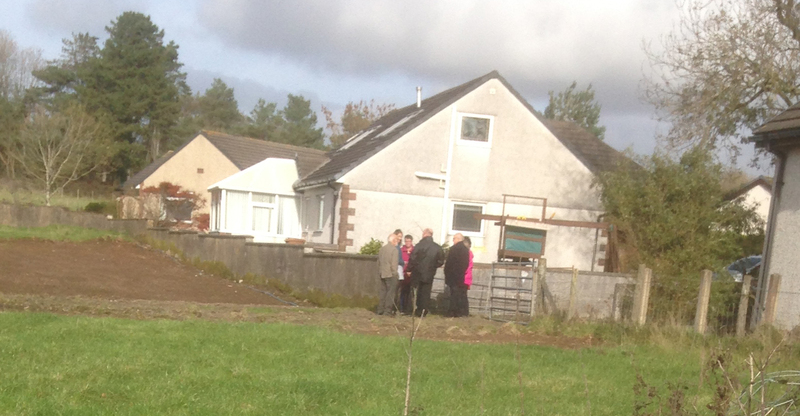 The planning panel visited both the cemetery and our site before granting permission. Our self build homes will be further away from the cemetery and grotto than some of the existing twenty plus years old homes at the busy Grove Court Hotel or Cross Grove; however we were assured that the existing homes and busy hotel including its very busy car park have not caused any disturbance to the cemetery or grotto. Click to view our planning application illustrative drawing with Google Earth extract to more clearly see where existing houses are and our proposed homes will be located. Our designs below, for plots 1 to 17, are to help you visualise what can be built, you are not restricted to the shown designs; we know that self builders wish to design their own homes to their own needs, tastes, size, specification & costs. All these plots are of a size for a large 2 story 10 meter wide by 10 meter deep family home; some plots will accept larger homes with detached garage. A limited number of single story bungalows and dormer bungalows with some 2 1/2 story homes can be considered. Plots number 18, 19, 20 & 21 are available for suitable persons who Copeland Borough Council consider would benefit from reduced plot prices. These 4 plots will be sold at 80% market value and any future resale will need to reflect this discount. All plot owners will be required to finish the outside of their new home including front and visible gardens within 12 month of commencing the build, this is a reasonable but readily achievable time scale and has the great benefit of making sure the full site is completed as quickly as possible; one of the major benefits of a self build is that you can further develop the interior of your new family home when your finances & time allows you to do so.